The vivacious manner of the Chesapeake Bay Retriever works alongside with its ability to be resilient. It has the ability to plunge into ice cold water due to its natural instincts for swimming and retrieving. While the Chesapeake Bay Retriever loves to be outdoors, its behavior tends to be much calmer in the home. It has an eagerness to take in new information, but also tends to be self-sufficient. Around other people and dogs it does not know, the Chessie may have protective or aggressive instincts. In fact, the Chesapeake Bay Retriever is known as the most tough and protective retriever breed. The energetic Chesapeake Bay Retriever requires intense physical activity. These needs can be met through a daily walk or a swim. 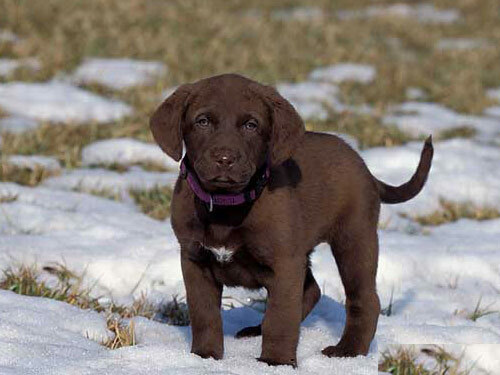 Commonly referred to as the Chessie, it prefers to be in a home environment with a family, but has the ability to survive in outdoor temperate surroundings. The coat of the Chesapeake Bay Retriever is unique in that its oily makeup makes it challenging to get it wet. For this reason, bathing the Chessie can be a challenge and may even damage the natural oils and water resistance qualities in its coat. Because of this, the wavy coat only needs brushing about once a week. The major concerns for the Chesapeake Bay Retriever are CHD, or Canine Hip Dysplasia, and gastric torsion. CHD is related to the hip development, whereas gastric torsion is a disease of the stomach. Some of the minor concerns for this breed are PRA, or Progressive Retinal Atrophy, and hypothyroidism. Occasionally seen in the Chessie are entropion, OCD, elbow dysplasia, and cerebellar abiotrophy. In order to keep the Chesapeake Bay Retriever healthy, test the hips, eyes, and thyroid regularly. The average life span of a healthy Chessie is 10 to 13 years. The story of the Chesapeake Bay Retriever is very unique. In 1807, an English brig shipwrecked off of the coast of Maryland. The brig happened to contain two pups, one black and on red, that were rescued along with the rest of the people and freight by an American ship. Originally believed to be Newfoundland pups, they began to reveal their talents as retrievers in the water. When word of the abilities of these pups spread, other local retrievers of backgrounds that were not determined arrived to be bred with them. Because of this, it is believed that the Chesapeake Bay Retriever is a combination of the Irish Water Spaniel, Newfoundland, Bloodhound, and possible other local hounds. Over time, the breed became increasingly distinctive, particularly for their endeavors into the waters of the Chesapeake Bay. Here the Chesapeake Bay Retriever would dive into the icy water and retrieve ducks. On land today, it gains significant recognition for being able to mark and remember the location of a fallen bird. The reputation of the Chesapeake Bay Retriever flourished outside the Chesapeake Bay Area, so much that is was recognized in 1885 by the AKC and it one of the oldest breeds to have been recognized. For reasons unknown, the Chessie has modest popularity even with the detail that it was developed in America.